The Cooperative and fishermen share the same feelings.The spirit of teamwork. 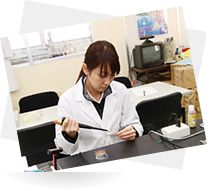 To supply safe food, we set up an environmental sanitation control laboratory and began a self-imposed testing system carried out by the authorized fish health protectioner and Type 4 water pollution control manager. We try to increase the survival rate by early detection and rapid cures as well as producing instruction in the proper use of medicine.We also diagnose of parasite infections, germ disease, sand viral diseases, and perform drug susceptibility tests (bacterial cultivation). To maintain safety and reliability, we perform a drug susceptibility test on one amberjack per fish pen at shipping. 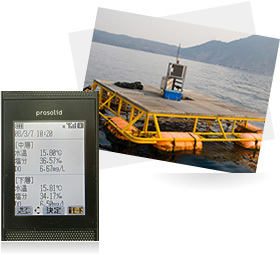 We check the water quality (temperature, salinity concentration and dissolved oxygen) in fishery grounds automatically around the clock.It enables us to feed fish properly and effectively so that we can reduce the cost of feed and the burden on fishery grounds.The data is accessible by cell-phone.